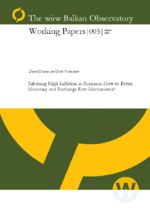 Subduing High Inflation in Romania: How to Better Monetary and Exchange Rate Mechanisms? Romania’s overall economic performance during the first ten years of transition can be termed so far as disappointing: the country has not been able to deliver steady growth, low unemployment and low inflation. This paper focuses on the effectiveness of monetary mechanisms and policies during this period. Special emphasis is set on the exchange rate mechanism. The first part of the text develops a short introduction to relevant monetary theory in the transition context. In the second part, we analyse the stylised facts pertaining to Romanian economy and put forward some weaknesses of its banking system and monetary policies. The conclusion presents a set of recommendations for a reform of the going monetary policy.